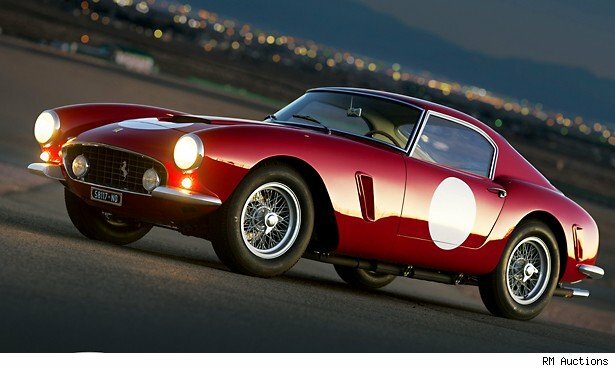 2013 started off with some impressive sales, including record prices for a mansion in California and Ferrari 250 GT. One famous baby even got a diamond-encrusted Barbie doll for her first birthday -- and you won't believe what it cost her parents. We learned this month that a 9,000-square-foot mansion in Woodside had quietly traded hands for the staggering price of $117.5 million dollars, making it the most expensive residence ever sold in California. The mansion was designed by Virginia-based architect Allan Greenberg, and sits on nine acres of property. It was never publicly listed, and the buyer remains anonymous. The seller was Tully Friedman of Friedman Fleischer and Lowe LLC, a San Francisco investment firm. A 1794 silver dollar that experts believe was the first such coin struck by the U.S. Mint sold for a record $10 million at auction at Stack's Bowers Galleries. The coin, called the Flowing Hair Silver Dollar, sold for more than double the previous $4.1 million record for a coin, which was set in 1999. It was purchased by Legend Numismatics, a rare-coin firm based in New Jersey, according to Reuters. The top lot at RM Auctions' Scottsdale, Ariz., sale this month, a Ferrari 250 GT SWB Berlinetta sold for more than $8 million after a bidding war. It's the fifth owner for the 1960 auto; the buyer remains anonymous. Baby Blue Ivy has been a celebrity from the moment she was born to Jay-Z and Beyonce last year. So perhaps it was inevitable that instead of a normal toy, she received a custom-made, $80,000 Barbie doll from her parents for her first birthday this month, as The Sun reported. What made the toy so expensive? It was supposedly encrusted with 160 diamonds and decked out in jewelry made from real white gold. An anonymous buyer paid a record-breaking $27 million for the 7,100-square-foot penthouse at Miami Beach's The Setai. The apartment, which takes up the entire 40th floor of the hotel/condo building, has a private infinity pool, hot tub, massive terrace, and floor-to-ceiling windows with views of the Atlantic. A 489-pound tuna caught off the coast of Japan sold at the country's Tsukiji fish market for a whopping $1.8 million, nearly three times the previous high set last year. The winning bidder was Kiyoshi Kimura, president of the company that operates Japan's Sushi-Zanmai restaurant chain. He said at the time that he planned to serve the fish to customers later that day. The iconic '60s Batmobile sold for $4.6 million at the Barrett-Jackson classic car auction in Arizona earlier this month. Los Angeles car customizer George Barris bought the 1955 Lincoln Futura concept car from Ford for $1. It took him 15 days and $15,000 to convert the car into the Batmobile. The buyer of the car is a Phoenix-area logistics company executive, Rick Champagne, who said he paid more than $4 million because of the woman who accompanied him to the auction. A photo of a teenage Diana Spencer before she became a princess sold at an auction house in New Hampshire this month for more than $18,000. The black-and-white picture shows "a young Diana lying in bed, with a young man seated behind her, and a bottle of Johnnie Walker sitting on the window sill." The buyer is still unknown. A woodcut titled "The Rhinoceros" sold for $866,500 at a Christie's auction in late January, well above the pre-sale estimate of $100,000 to $150,000. While the buyer of the piece, which dates from 1515, remained anonymous, the seller was identified by Bloomberg as Swiss collector Samuel Josefowitz. A rare coin from 1796 -- one of only 1,400 half-cent coins ever minted at the Philadelphia Mint -- sold for a high price at auction in England this month. Prior to being sold, the coin had been hidden inside a matchbox for 50 years before it was discovered by the family of the man who previously owned it, according to the IBTimes. How do those buys stack up?